After the top 10 anglers competed on Sunday, Keith Combs of Huntington, TX claimed the championship at the Toyota Texas Bass Classic. Dominating the weekend, Combs won wire-to-wire staying in the lead all three days of competition. Combs took an early lead on Friday, and the momentum stayed with him. After opening round limits weighing 24 pounds, 8 ounces on Friday and 23 pounds, 4 ounces on Saturday, the Texas pro knew he still had work to do on Sunday. Putting together a 15 pound limit on Lake Conroe, Combs’ cumulative weight of 62 pounds, 12 ounces easily outdistanced the 2nd place weight of John Murray by 12 pounds, 8 ounces. The victory capped off an incredible 2013 season for Combs that included a Bassmaster Elite Series win on Falcon Lake this past March and a 5th place finish in the Elite Series Toyota Angler of the Year point standings. 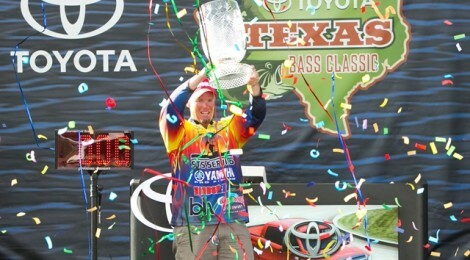 Combs also became the first angler to earn a second TTBC championship ring after winning on Conroe in 2011. 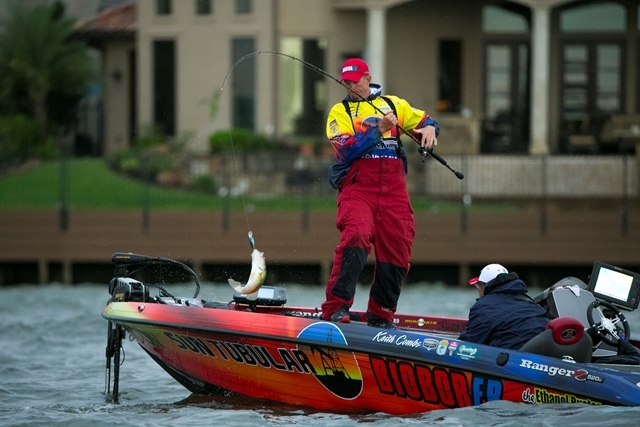 John Murray started Sunday on Lake Conroe with nothing to lose. Tied for 9th place with a two-day total weight of 28-8 and nearly 20 pounds out of the lead, the Arizona pro had nowhere to go but up. Murray took full advantage of the opportunity, boating the heaviest limit on the final day weighing 21 pounds, 12 ounces to climb all the way up to a 2nd place finish. In addition to bringing home the TTBC trophy, Keith Combs also won the Leer Heavyweight Bag competition, awarding the angler with the heaviest bag weight over the course of three days bringing in a weight of 24 pounds, 8 ounces on day 1. The 2013 ATX Wheels Big Bass Award, went to Jason Christie for his 9 pound 4 ounce bass caught on Friday. “I was actually fishing for a limit (small keeper bass) at the time. I was expecting to catch two-pounders when that big one bit.” The 9 pound bass is the biggest bass Christie has caught all year. The Toyota Texas Bass Classic remains a non-entry fee event, with all 50 competing anglers taking home guaranteed prize money. Partnering with the Texas Parks and Wildlife Department, the tournament continues its focus on conservation and follows a strict catch, weigh, and immediate release format that has earned the event national praise for its conservation efforts. To further promote the catch and release program, a generous donation of $250,000 was given to TPWD on behalf of the Toyota Texas Bass Classic to fund youth education and outreach programs, bringing the total donation to $1.75 million over the past seven years. Bringing out the inner child, angler, Toyota junkie, and country music fan in all of us, this event is more than just a world class bass fishing championship. Families were able to explore the Texas Parks and Wildlife Outdoor Adventures Area and the Bass Pro Shop Kids Zone. Fans also enjoyed the Toyota Drive center featuring the 2014 Tundra and the new and improved Yamaha ATV Test track. Over the course of the weekend, the TTBC included free concerts each day. Eli Young Band kicked off the weekend followed by Southern Slang and The Band Perry on Saturday. Rounding out the star studded lineup, Thompson Square and Gloriana took the stage Sunday to close the event. In addition to fishing, concerts and family activities, the 2nd Annual BBQ Cook-Off was held on Saturday, October 5th. There were three categories and a cash prize award for the top 12. To anyone who had Robin Meyers’ BBQ this week it was no surprise when she won the grand for overall best BBQ. Robin was on team, Lady M&M Cookers and she walked out of TTBC with a trophy that stood equal to her in height. Robin won first place in two out of the three categories along with her big overall win.